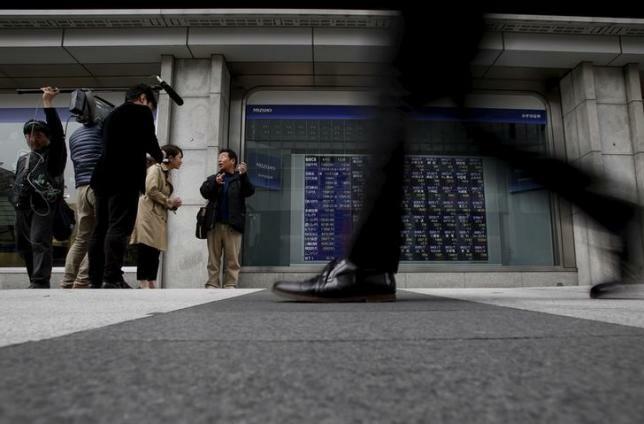 TOKYO – An index of Asian shares extended losses on Monday after Chinese imports declined more than expected, while the dollar was higher after upbeat U.S. employment data raised bets that the U.S. central bank would raise interest rates as early as September. China’s exports fell less than expected last month, but imports tumbled at a greater pace, stoking concerns over a slowdown in the world’s second largest economy and giving Beijing more reason to take further stimulus steps. China’s exports in May fell 2.5 percent from a year earlier in dollar-denominated terms, better than market expectations, while imports tumbled 17.6 percent. Considering expectations of a slight rebound in import levels in May due to recovering crude prices, “the continuing fall in imports suggest demand side factors – softening domestic consumption – are at play,” said Chester Liaw, economist at Forecast Pte Ltd in Singapore. MSCI’s broadest index of Asia-Pacific shares outside Japan was down 0.5 percent, while Japans’ Nikkei stock index erased early losses and fell 0.2 percent. On Wall Street on Friday, major indexes were mixed, and nearly flat for the week, while the U.S. benchmark Treasury yield marked its best weekly performance in two years and touched an eight-month high after the jobs data. U.S. nonfarm payrolls jumped 280,000 last month, the largest gain since December, while payrolls for March and April were revised to show 32,000 more jobs were created than previously reported, the Labor Department said. The 10-year Treasury yield rose to 2.402 percent in Asian trade, compared to its U.S. close of 2.400 on Friday. Higher yields helped power the dollar to a 13-year peak of 125.86 yen on Friday. It was last down about 0.2 percent on the day at 125.43 yen. An index measuring the dollar against a basket of six major rivals edged up 0.1 percent to 96.391. The greenback gained on the euro, which remained pressured by Greece’s ongoing struggle to solve its debt crisis. The euro bought $1.1106, down about 0.1 percent on the day. On Sunday, the head of the European Union rebuked Greek Prime Minister Alexis Tsipras in unusually sharp terms, and warned that time was running out for Athens to reach a debt deal with its lenders to avert default. The strong dollar weighed on commodities prices, with oil logging weekly losses despite a rally on Friday. The downbeat Chinese import figure did not help a market already concerned about oversupply after oil exporter group OPEC agreed to stick by its policy of unconstrained output for another six months on Friday.